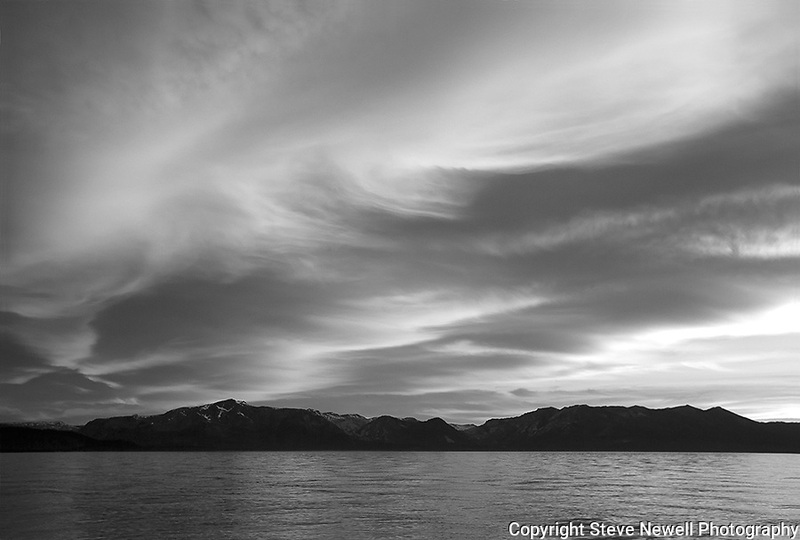 "Fire on the Mountain" Black and White. Nevada Beach is located near the casinos on the Nevada side of South Lake Tahoe. The color that developed that night was simply amazing. I shot over 60 photos of this sunset. The clouds started out white and grey then slowly turned the orange shades you see here. Out of the 60 photos I took of this sunset only 3 have this shape and color. Sunsets are extremely difficult to capture due to the changing light available and short amount of time to capture it. Mt Tallac can be seen across the water with its identifiable cross. This sunset truly reminded me of a Fire on the Mountain! !